Hanoi (VNA) - The national index of industrial production (IIP) rose by 2.4 percent year-on-year in the first two months of 2017, according to the latest report of the General Statistics Office. The electricity production and distribution saw a growth of 9.3 percent while processing and manufacturing sector registered a 6.6 percent increase. The water supply and waste treatment sector also expanded by 6.6 percent, but the mining industry suffered a strong drop of 13.5 percent. Several main industrial products achieved good growth, such as rolled steel (35.4 percent), television (16.7 percent), automobiles (15.2 percent) and apparels (14.3 percent). Products that saw reductions in output included artificial fiber (1 percent), coal (6.3 percent) and liquefied petroleum gas (LPG) by 8.5 percent. 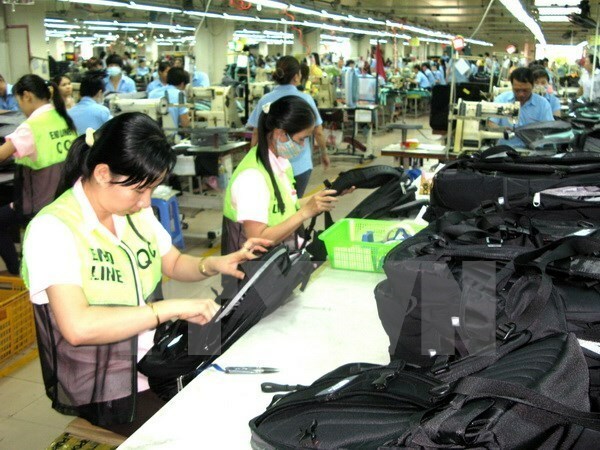 In the reviewed period, several localities with large-scale industrial production reported growth, such as Hai Phong (17.2 percent), Thai Nguyen (10.1 percent), Da Nang (9.6 percent), Hai Duong (9.4 percent), Binh Duong and Dong Nai 5.9 percent, HCM City 5.8 percent, Hanoi 5.1 percent and Can Tho 4.9 percent. The inventory index of the manufacturing and processing sector as of February 1 increased by 13.3 percent from the same period last year. Some sectors with surges in inventory index included paper and paper-products with a 106.9 percent rise, beverage 66.6 percent; electronic products, computers and optical products 61.3 percent, and non-ferrous mineral products by 43.7 percent.